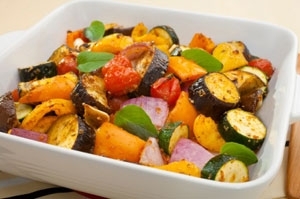 A winter favorite, aromatic roasted vegetable dish incorporates the natural bounty of the season. Serve with marinated roasted red peppers, a chunk of feta and a slice of rustic bread. Place all ingredients in a heavy, shallow baking pan, toss together and bake (about 1 to 1 1/2 hours total, covered for the first half hour) until tender, stirring occasionally. Add some olives and capers and it's perfect!